Handcrafted using a combination of pure herbs with saponified essential oils as a nurturing soap-free base. 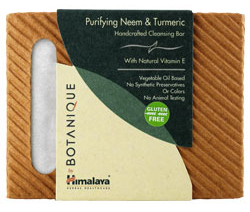 Neem, a time-honored botanical used for thousands of years to detoxify the body, and Turmeric, empower this earthy cleansing bar to promote healthy looking skin. Leaves your body fresh and rejuvenated without dryness.